Life is not always black or white. In fact, over my 52 years of living, I’ve learned that life most often settles within that frequently annoying, vast grey zone where matters are unclear and as such it’s left up to each individual to decipher meaning, worth, choices and direction in our own life. That, in fact, is a pivotal part of the journey called life. As such, this is a long blog piece, but I hope those reading will give it the time it warrants. Here in Ireland, the country is deep into the debate of whether to repeal the 8th amendment and allow abortion to be legal, or to change the amendment somewhat, or, there is always the possibility the referendum will turn out a majority vote where the 8th amendment remains. The social media storm on the subject has been distressing for me for a number of reasons which I will address here. But first, let me make my position known, as I have yet to do that publicly, nor will I do so again because it is just too emotional a topic to delve into daily when I already face death – and life – every day. That is the grey area of the subject which I will try to explain. I have lost 5 pregnancies to miscarriage. I have seen what should have been a baby in my arms fall out of me onto a bathroom floor at over 2 months gestation. (Sorry for the visual, but this is my reality, my experience, and this is not a pretty subject.) This is why I want to vomit each time I see the disgustingly graphic and shameful posters of the “Pro-Life” campaign. To them I say, how dare you. The fourth loss was the most traumatic for me. The baby was a little girl. Her heart stopped beating around 12 weeks gestation due to Down Syndrome. I shall never forget laying on the hospital bed as the technician slowly rolled the ultrasound wand across my lower abdomen. There she was, looking so perfect. It was the first pregnancy the baby formed fully. (I discovered after the 3rd miscarriage that I had a condition requiring medication to keep the fetus growing and forming throughout the first trimester.) So, there was this baby…arms, hands, fingers, legs, feet, toes…perfect…except there was no heartbeat. The technician called in a doctor. I lay there crying. The doctor confirmed what the technician feared. I was sent home to await a call from my Obstetrician. The call came shortly after I got home. I had an option – a choice – to wait for the baby to miscarry naturally (which at that stage would be hard on my body) or to have a D & C. At my Obstetrician’s advice, I chose the latter option, and it was scheduled for the next day. I remember having a conversation with him that next day where I asked how could we be certain the heart stopped. I was a mother-to-be who had never seen via ultrasound a perfectly formed baby inside of her womb. “I don’t do abortions, Tracy” he told me straight up as he reassured me they would do another ultrasound to be sure before the procedure. We did the scan. There was no heartbeat. And I let them put me under for the D&C. I awoke it agonizing pain like I had never experienced before. The nurse gave me more pain medication as I lay there in a recovery room listening to the other women, some talking, some crying, others quietly looking at the ceiling. I remember knowing that some of them were there for elective abortions, unlike me, and honestly it angered me. The woman who was next to me before the procedure was crying to her husband on the other side of the curtain…“I can’t do this, mi amor, I can’t” she pleaded in despair. As I listened, I learned they had “too many” children already and were struggling to make ends meet as it was, so, there they were, next to me who was waiting to have my dead baby removed, furious they were about to get rid of a baby because they had too many already. If I had a vote at that point, it would be to keep the 8th amendment. Full stop. I was so angry at them…at him, primarily. Yet, as I look back now, it was because abortion is legal (this was in America), that I had the option of the D&C the next day after learning the baby had died inside of me. THIS IS THE GREY AREA OF LIFE. It was a few weeks later when the lab sent the results that I learned the baby was a girl and that she had Down Syndrome. This is why her heart stopped…I had my answers, but the emotional pain was no less. My next pregnancy – my 5th – was the inspiration for this very blog: My beautiful, angel boy Brendan Bjorn. As I was 38 at the time, they ran numerous tests and performed as many scans to assure that there were no abnormalities. The standard, early tests in America for DS and neural-tube defects were fine. The ultrasounds from the first through the second trimesters were equally fine. Finally! Finally! After 4 losses I was about to have that long dreamt of baby in my arms! In the third trimester they began to pick up what they thought was a smaller than average head size, but it was written off to either genetics or to Brendan being so low and head down that it was hard to get a proper reading. I worried, but was assured it was nothing as all else was perfectly fine. Fast forward to 1 October 2004, at 39 weeks, Brendan Bjorn was born – perfectly healthy scoring 9 on both the 1 and 5 minute apgar tests. Tests can be wrong. Very wrong. I learned this heartbreaking fact over the next 4 weeks. After Brendan Bjorn, I lost another pregnancy: my 5th and last loss. I tried one more time, this time using IVF, to have another baby, and at age 41, I became pregnant. Again, with my “advanced maternal age” they ran numerous blood tests and scans from early on. The blood work came back with bad news – very likely the baby forming had Down Syndrome. Then the next round of blood work – very likely the baby had a neural-tube defect (such as Spina Bifida). The perinatal specialist ran detailed, highly advanced scans. There were 2 physical markers for Down Syndrome present. I also learned the baby was a boy. I wanted to know this time around, whereas with Brendan I didn’t want to know. You see, I felt detached from this baby because of all of the probable health issues. I hoped that if I knew the gender and named the baby, it would help me bond with him. I sat on the edge of the examination table looking at my Obstetrician. I will never, ever forget her words: “Tracy, considering your situation with Brendan, no one would fault you if you terminated this pregnancy.” No, I can’t do that. Or, could I? Would I? My world was spinning out of control. I went home, sobbing, and rang a close friend back here in Ireland. She sat on her couch sobbing while I sat on mine doing the same. A fiercely devout Catholic, she said she thought God would understand if I did choose to terminate. She said she would understand, too. I had no answer. All I knew is that I needed to make up my mind, and soon. I rang the perinatal obstetrician the next day and said I wanted an amniocentesis done. It was arranged immediately and despite the risk of miscarriage, I was somewhat relieved I would have more definitive answers to base any decision upon. I learned this fact as the amniocentesis showed how skewed blood work can be and how wrong scans can be. My baby boy – who I had decided to name Declan – was perfectly healthy! I burst out in tears and the nurse asked if I was ok. Yes, yes, I’ve never been better, and I told her the story. She was overcome with joy as well and gave me a hug. Back to business, and Brendan was being wheeled back for a long, risky operation. My amazingly special boy, Brendan Bjorn, you are going to be a big brother, I whispered to him. Yes, I am pro-choice. Yes. But…with that choice…I worry that decisions will be made on faulty tests or out of the fear that the parent(s) can’t “handle” whatever the baby may bring to their life – be it another mouth to feed or having to care for a disabled child. I worry because I know there will be regrets, heartbreak, and life that deserves to be born but won’t be. Yet, I am pro-choice because I have no right to tell any woman what to do or not to do with life growing inside of her. I simply do not have that right, and this is why I support women having the right to choose. If I could go back in time, knowing what I know now about Brendan Bjorn’s condition and the often back-breaking, soul destroying journey it has taken me on, I would NOT change a thing. For what he has given me, taught me, and will continue to do so even after his soul moves on, far outways the struggles that have been placed before me these past 13 years and counting. And, lastly, I am so deeply thankful that I didn’t make a decision to terminate my baby boy – Declan, I am speaking about now – based on emotions of fear at the moment, or on the blood work and the detailed ultrasound anomaly scans, all which were proved wrong by the amniocentesis. For what he has given to me, taught me, and will continue to do so as he grows into the fine young man he is becoming, far outways the struggles of being a single mother. If it wasn’t for Brendan, I wouldn’t have tried so hard to have another child…which means that today I wouldn’t have Declan. I cherish both of them equally with every fibre of my being. It was all about the choices I made that I have them today, and all that they enrich my life with every single moment. I am pro-choice. Choose wisely, sisters, with the deepest of soul-searching you have ever done. Whatever you choose, it is your journey. Remember: life is most often lived in that grey area of not knowing what to do. No rest for the weary. And little help for the child who, as of today, has laid in his bed for 91 days. The boys and I moved eight days ago. It’s been nonstop since. This morning is the first time I’ve had a chance to sit down and put thoughts into words here. Pardon me while I cover a week’s worth of caring frustrations. Where do I start, is the question of the moment. I could start with the initial experience trying to contact Brendan Bjorn’s PHN (public health nurse) for our new town. His pressure sore has become far worse, so yesterday I rang in hope of getting her to call out to the house. It was a Monday, after all, so what could go wrong? Well, she wasn’t in yesterday…as the other PHN notified me. I asked if she herself could come out instead, as I described the sore and my worries. No, can’t do, as she’s not the PHN that’s been assigned to him. But…and I went on to describe it again, adding that I don’t even have any spare dressings at this point. Well, I won’t be on that side of town, I heard. *Note: Dundalk is no metropolis* But…and I went on to describe it again, and how the current dressing has now been soiled on and must be changed. She would try, I heard. But…and I went on again to say even if she could just put them through the letter slot. She would try, I again heard. Yes, they did get delivered, thankfully. The dressings were delivered with a push through the letter slot. Not a knock on the door to introduce herself or, what would have been even better, 3 minutes to just examine the pressure sore of my precious angel of a son who now lays in his bed for 91 days being driven up here for our move and him to and from the occasional respite – drives which have undoubtedly made the sore worse each time. I could also go on about how I need to now fill out a new application for his LTI card (long term illness card) because we moved from Kildare to Louth. New form, another doctor’s signature to try and obtain, and then the wait for the card. This card is what covers all of his life-saving medications and special PEG formula. The kind pharmacist down the road has received a 1 month approval to fill Brendan’s scripts until the new card comes in, so I cannot drop the ball and delay this process. I could also go on about how just around the corner from our new rental home, there was a bag of drug paraphernalia on the footpath to my younger son’s primary school. A path that dozens of children walk on each school day. Bent spoon, remains of a needle, tucked into a bag laying in plain sight in the middle of the footpath. That frightens and worries me. I think it should worry us all, to be honest. I could also go on about how 500K of additional funding for Carer based programs was announced yesterday, but how it actually won’t impact many of us at all. The fact remains that Carers like me will be cut off of the only financial support 12 weeks after – as it was so calmly worded in this document – our carer role has finished. The document contains the following quote: “The Government recognises that caring can have a significant impact on the physical and mental health of the carer Do you, Government, truly recognise the significant impact that caring has had on me (and many of us carers) physically and mentally? Do you know that I know have degenerative disc disease in my lower back and am in chronic pain? , as well as their social life and personal finances. Do you, Government, truly recognise the significant impact that caring has had on my (and many of us carers) social life and personal finances? Do you know that I no longer have a social life to speak of? Do you know that I have no personal finances to depend upon? I have no pension, no savings, no ability for a holiday to recharge my depleted self or to buy many needed items for my family, especially as a lone-parent carer? Following the death of a loved one, carers may also feel isolated Do you, Government, truly understand that I (and many of us carers) already feel isolated, so following the death of our loved one we may be left feeling even more isolated in a world that has been passing us by while we were at home for years on end caring? and can face distinct challenges in making the transition from being a carer to having a reduced or no caring role Do you, Government, truly understand that I (and many of us carers) will be left with long-sacrificed careers which we cannot re-enter due to our age, our now poor health, our no longer being ‘marketable’ and ‘current’?, while also dealing with the feelings of grief and loss Do you, Government, truly understand that I (and many of us carers) should already have access to full palliative supports for our entire family, including professional mental health counseling if requested?. For the carer, there are challenges in changing routines and activities and new challenges emerge after their caring role finishes And do you, Government, realise how condescendingly trite and even hurtful that last sentence is? No, I don’t think you do, because you don’t actually comprehend the life of a full time carer. It’s now 12 noon and still no return call from the PHN. Brendan Bjorn still waits. I still wait. 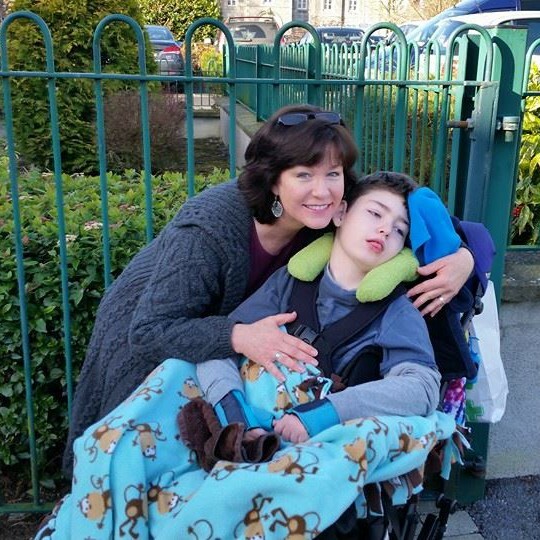 And in our wait, I continue to voice what is wrong with the system – despite my fear of reprisal – because the only way we carers will see change for our disabled family members and ourselves is to speak up and passionately advocate for necessary reforms. No, there is no rest for the weary…and little help for the child who, as of today, has laid in his bed for 91 days. Today I had one of the most powerful, heartbreaking, interactions with someone that I can recall. This someone was a total stranger to me, yet I somehow knew who he was the moment I stepped into the hotel lift. I asked him a question, and with a gentle smile and two words of very broken English, learned there was no language to be shared between us. We got off the lift, he went his way and the boys and I went our way, which was over toward the front desk to check out of the hotel. As I turned to head out the main door, the young man was coming back inside. He smiled and nodded at me. With a bit of a tremble inside, I held out my mobile phone which showed the photo of another young man. He looked up at me, nodding again, and my hand went to my heart…”I am so sorry” I said to him. Our hands reached out for each other (I don’t know who extended their hand first) both of us, our eyes welling with tears, just held hands. We just stood there in the hotel lobby as we continued to quietly hold each other’s hand, tears ever growing, and with no words able to be exchanged. But words aren’t always needed in the language of heartbreak. After a minute – or was it a few? I don’t know – our hands began to release from the other’s, with a gentle squeeze a time or two as they fell apart. There were tears that came in the understanding gaze between us, then the respectful bows of the head to one another, and with that, we began to move apart. He took a few steps and turned back around…hands with palms close together at his chest, he bowed to me. And in absolute respect, solidarity and the aching empathy of heartbreak, I returned the bow. With that, we parted ways. I loaded the boys into our van, sat on the driver’s seat, and sobbed. Uncontrollably sobbed. I don’t think I have ever felt so powerfully the emotion, the pain, radiating from a grieving person’s hand up through my own hand as I held it, and as our eyes connected in that unspoken language of heartbreak. I don’t know his name, although what came to me as I held his hand was the word “brother” so my heart tells me that this was, either biologically or emotionally, his link to the smiling young man whose photo I held out hesitantly to him on my mobile. Heartbreak doesn’t need the same language to be understood when there is compassion, empathy, and genuine caring between people who have experienced grief. One touch, many tears, and the silent expression of love can bridge the absence of spoken language amongst those in pain. My heart goes out to this young man in the hotel who travelled to our island country under the most horrific of circumstances – to bring home someone he clearly loved but who had been taken from him in an incomprehensible and terrible act of violence. I wish him, and his family, the healing peace that I think only time can bring. But I also want to thank him for sharing so much with me on a level that we don’t often get to experience with others with whom we cannot share via the spoken word. Whether he knows it or not, today he gave me this rare and special gift. It’s only 5 days into 2018, and here I am writing about being in crisis. The hashtag about this on Twitter as of late is #carersincrisis and it says it all. But who is actually listening? More importantly, who amongst those listening will take any action to resolve the crisis? I often write from a raw, unfiltered place, exposing my personal world at the risk of judgement and the subsequent ridicule or unsolicited advice to more devotedly follow Jesus or the comparisons of who has the worse lot in life. That’s not my reason for wearing my heart on my sleeve. I do it for starters because that’s just who I am by nature, but I also do it on the off chance it will help others who walk a similar journey with me…that journey of caring for a child with a life-limiting illness. It is a journey unlike any you could fathom. Indeed, it is one you must actually be on to fully comprehend…and to have absolute compassion and empathy for those on it. Last month, I knew I was near a breaking point. I was once again having panic attacks, had a breakout of shingles due to stress, and found myself crying far too much. I did what I knew I should do and I reached out for help from a respite provider’s psychologist. I was refused any additional respite nights because there were other families who were requesting the extra nights as well. Now I, of all people, can understand that fact. However, not providing emergency care for carers in crisis leaves those carers – like me – in a very vulnerable position. This is exactly why we have #carersincrisis. Confession: Last night I discovered I had not reordered one of Brendan Bjorn’s seizure meds. As such, he only got a partial dose. This morning, his disability social worker is picking up the new bottle of medication from the pharmacy on her way out to see us. The amount of guilt I felt last night, and the resulting mental self-reprimanding I gave to myself, was noteworthy. I could list a dozen excuses about being stressed out, overworked, etc, etc, etc, but none of them are acceptable. I failed, full stop, and I am ashamed at my failure. Today is day 73 of Brendan still being bedridden due to the terribly slowly healing pressure sore. 73 days and I am exhausted physically, mentally and in many ways, spiritually. My soul is tired and needs recharged in a way that only time away from caring can provide…but I can’t get it. I’ve had no in home respite nursing since July 2017 (I’m approved for only 10 hours per month, even so there is no staff to provide it). I do have 3 nights of respite coming up this month but it will be used moving my family to a different city, different county, and that, my dear reader, is more stressful than you can imagine when you have a highly medically complex disabled child’s care needs to transfer and re-establish! I won’t be recharging anything but my mobile phone.